Electric cars did not have the impact in England that they had in other gas-starved countries such as France during and after the war. The Hazelcar, named after R.E. Hazeldine of Hazeldine Motors, was a rare but serious attempt to change the course of things. In 1952 the English company Gates & Hazeldine in Hove financed this project of the Battery Manufacturing Association (BMA) in Hove to manufacture an electric vehicle. 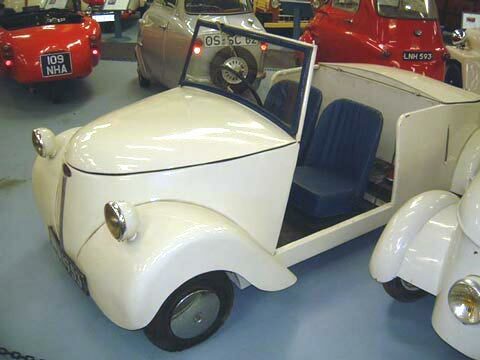 The bodyshell was a pleasing roadster style with doors (missing on this example), which was fabricated in aluminum. Power was by a specially designed 1 _ or 2 hp electric motor fed by nine six-volt batteries stowed under the bonnet at the front. Drive was via a double-reduction chain drive from a four-speed gearbox and a switch-operated reverse. Speeds up to 20mph and a range of up to 60 miles were quoted, but as with many electric vehicles, actual figures varied, being severely compromised by load and road gradients. At £535 it was too expensive to have any impact. A van version was also offered, but six cars were only ever built, the last one powered by a Ford Eight (the British four-cylinder, not V-8) gas motor. Weight: Electrics: 40 v 4 Wheels: 4.00 x 8"